Skype and Facetime have become ubiquitous fixtures in the collective internet psyche. So why aren’t banks and credit unions offering mobile video banking services? If financial institutions want to deliver a truly exceptional mobile experience, remote two-way video banking is the next logical step. Consider this scenario. A young couple is researching home loans. They find an attractive rate at a local institution, but they have a few questions about the application process and what documentation they need. A mortgage is big commitment, and the nature of their questions don’t really feel appropriate for email. They want to speak to a loan officer, so they get in the car and drive to the nearest branch. Unfortunately that branch doesn’t have a mortgage expert. But… there is a conference room with a video camera that connects them to a mortgage lender in a centralized location. The couple’s questions are answered via a two-way video conversation, and the institution is proud of the tech-savvy experience they’ve delivered while also reducing its overhead. On the surface, it seems like a win-win. The only problem? This young couple thinks it’s stupid. “Why couldn’t we have just done this video chat thing at home when we were on our iPad?” the husband asks. The young couple may not be aware of all the debates the institution’s IT team had about security and privacy issues when weighing the option to offer video banking. But the couple’s criticisms are fair nonetheless. Why can’t financial consumers use their tablet or smart phone to connect to the mortgage lender from the comfort of home… or wherever? Everyone uses services Skype and Facetime these days. In fact, 4.9 million consumers use Skype every single day, and the Skype mobile app has been downloaded one billion times. Heck, if Grammy June can use mobile video on her iPhone to chat with her grand kids, then why can’t a bank or credit union do it too? Read More: Is Digital Video The Next Big Thing In Financial Marketing? For financial institutions that already offer video banking services, there are a number of benefits. For one, It’s obviously more cost effective to have consumers access centralized expertise rather than placing multiple experts at every branch location. It’s also technologically innovative; financial institutions definitely believe that video banking helps position them as leading-edge. Vidyo has identified four critical areas where financial institutions can improve the customer experience by providing video banking services. 1. Self-service assistance. Video brings concierge services to sales transactions. Seeing a person changes the interaction by enabling trust, emotion, and engagement. The typical scenario for such a use case is the ability for the customer to contact a contact center agent through a click-to-call option on the bank web site, mobile application, or even from an ATM or a branch kiosk. 2. Visual troubleshooting. In certain circumstances, being able to see exactly what customers see is the key to addressing their needs quickly and effectively. Insurance claims are a typical use case where video can be used to assess damages remotely, settling cases in days instead of weeks. 3. Consultative selling. With financial service, the sales cycle can be long, and multiple interactions may be required along the customer journey. Mortgages are the perfect example. By making it more convenient to customers to have quality meetings when and where they want, video enables more frequent and meaningful interactions that ultimately streamline the sales process and increase conversion rates. 4. Expert access. Subject-matter expertsare some of the most highly-demanded resources. It’s often impossible to have an expert on each and every topic sit in every single branch. Video makes it possible to centralize the most valuable resources and have them available to everyone to fully leverage their expertise, even in the most isolated areas. Customers can meet an expert from the convenience of their home or even during a visit to the local branch where their regular advisor can bring the expert in the meeting as needed over video. There are two ways to deliver video banking services. The first is through kiosks, ATMs or branches, what we can loosely refer to as “in-branch video”. The big rub with this approach is that consumers have to physically get in their car and go somewhere — not a big improvement. The second way to deliver video is remotely, where consumers can interact with their banking provider via mobile device or from a home/office desktop computer. Most financial institutions that have already waded into the video banking waters opted for the in-branch model simply because it afforded them the level of security and control they wanted. But it’s only a temporary solution, not the future of remote delivery in the banking space. 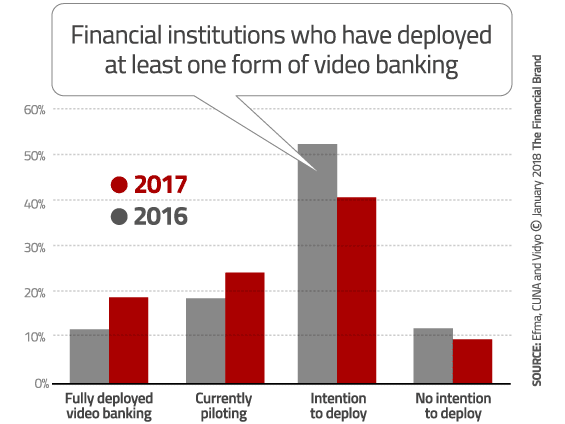 A report authored by Efma in conjunction with Vidyo and CUNA notes that banks and credit unions have started moving toward video banking, with more respondents in their 2017 indicating that they are either fully deploying, piloting or intending to deploy at least one video delivery platform versus 2016. The chart above looks at both in-branch and remote video banking combined. That means one in five financial institutions have deployed one flavor of video banking or another. Only 10% of all banks and credit unions say they have no interest in deploying any type of video banking. Now the chart below distinguishes between the two types of video banking (in-branch vs. remote). Basically, more banks and credit unions say that they are more likely to offer remote video banking services than in-branch. While 20% of banks and credit unions say they have no intention to deploy in-branch video banking, only 9% say they won’t deploy remote video banking. 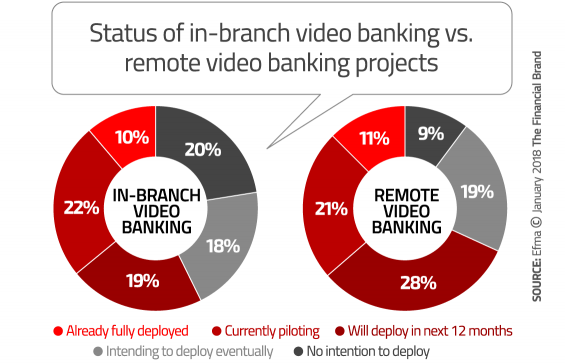 Likewise, 19% say that they intend to initiate in-branch video banking within the next year while 28% plan to initiate remote video banking within that same time frame. One of the major challenges with video banking is that the technology has to be reliable and secure. You must give consumers a good quality video experience or risk frustrating them. Just think about how annoying it is whenever a streaming video starts buffering. According to Vidyo, these are the top five technical requirements for video banking. High quality video is important to the 59% of banks and credit unions that have not yet deployed a video banking service. The only features financial institutions consider more important are security (67%), and the ability to support a variety of devices (65%) — desktops, laptops and smartphones on various operating systems. Pioneer Federal Credit Union, in southwestern Idaho, has used Personal Teller Machines (PTMs) in branches since 2015 to connect its 52,000 members with employees via a live video feed. PTMs are basically walk-up or drive-through ATMs with video conferencing capabilities. The credit union offered PTM access with longer service hours, 7:00 am to 7:00 pm Monday through Saturday. To take video banking services to the next level, the credit union has also been testing a remote video banking feature it calls myPioneer Personal Assistant to members spread across the U.S. and those stationed in military bases overseas . myPioneer Personal Assistant displays both live video of the banking agent on the top half of the screen, and, if needed, the bottom half can display whatever form(s) may be appropriate. If a member is completing a loan application, the agent can display the application and the member can sign it with right then and there with their fingertip. Pioneer Federal Credit Union is currently testing myPioneer Personal Assistant remote video banking as a stand-alone app but the credit union plans to integrate it into its mobile banking app at some point. Smaller banks and credit unions are also implementing video across mobile and web in addition to in-branch Texas Tech Federal Credit Union and Southwest Financial Federal Credit Union, with only $60 million in assets and two branches, are both using the POPin Video Banking solution.